A fuel cell is an electrochemical energy conversion device that converts hydrogen and oxygen into water and creates electricity in the process. It is like a battery but needs constant supply of fuel to sustain its chemical reaction and electricity production. Hydrogen is the most common fuel for fuel cell, but hydrocarbons like natural gas and alcohols like methanol are also used. As hydrogen is the most abundant element in the universe and there are number of ways to turn it into a fuel, fuel cell stand out as a promising alternative energy source. Hydrogen can be produced from fossil fuel like coal, oil, natural gas but it can also be produced from green and renewable energy sources like biomass, wind, solar, geothermal and hydroelectric power. So hydrogen fuel cell can play a big role to fight against climate change. 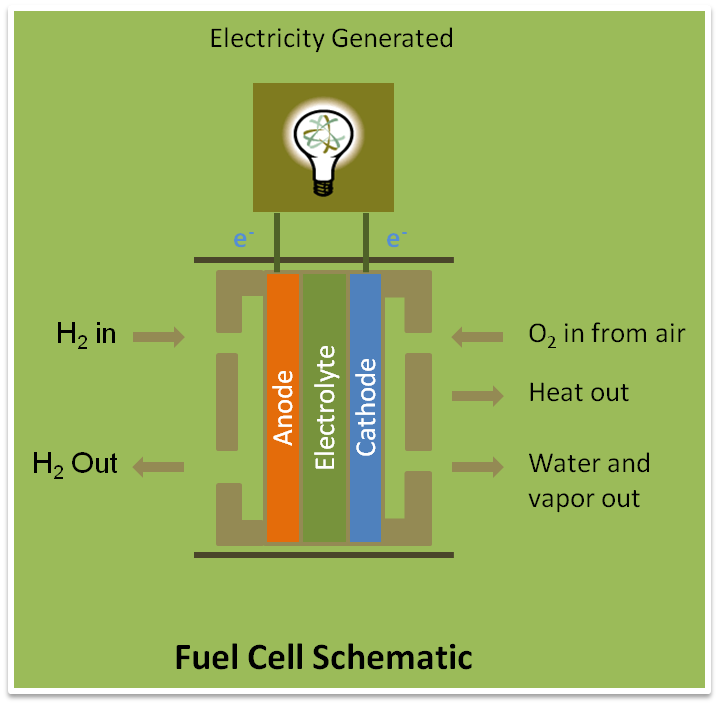 Fuel cell produces energy/electricity in the process of combining hydrogen and oxygen together to produce water. Hydrogen is supplied to the fuel cell as a fuel or energy source and oxygen is supplied to the fuel cell as air (which contains oxygen). They are supplied from two opposite ends of the fuel cell. Inside the fuel cell hydrogen and oxygen (air) is separates through a screen that allows only hydrogen atoms to pass through it without the electrons. In the hydrogen side the plate that help separating the electrons from hydrogen atoms are called anode catalyst. These separated electrons flow through a separate wire to the oxygen flow side where there is another metal plate to act as a cathode catalyst. There the hydrogen ions that pass thorough the screen combine with oxygen along with the electrons travelled through the wire to produce water. This water and excess vapor come out from the exhaust pipe as bi-product. The travel of the free electron through the wire is the desirable electric energy that can be captured and used for different purposes. The efficiency of a fuel cell is good usually 40-60%. A schematic diagram of fuel cell is shown in the figure. Alkaline fuel cells (AFCs) use a solution of potassium hydroxide in water as the electrolyte. This is one of the oldest designs for fuel cells. They were the first type of fuel cells widely used in the U.S. space program to produce electrical energy and water on spacecrafts. Although the high-temperature AFCs operate at temperatures between 100°C and 250°C the newer AFCs can operate at lower temperatures of roughly 23°C to 70°C. AFC has high performance efficiency (60% in space applications) for its higher chemical reaction rate inside the cell. The disadvantage of this fuel cell type is that it is susceptible to carbon dioxide (CO2) contamination. So it requires pure hydrogen and oxygen to operate. This susceptibility to poisoning also affects the cell's over all lifetime making this cells further costly. So for the main stream commercial market is cells are not the most cost effective one. Polymer Exchange Membrane Fuel Cell (PEMFC) also known as Proton Exchange Membrane Fuel Cell (PEMFC) and Polymer Electrolyte Membrane Fuel Cells (PEMFC) and resulted in the same acronyms. PEMFC uses a solid polymer as an electrolyte. They are also in general operates with pure hydrogen and the oxygen is supplied from the air. PEMFC usually operates in the low temperature at around 80 °C. This low temperature operation allows it to start up quickly and offers better life span and durability. PEMFC are mainly used in transportation applications. They are very suitable to use in passenger vehicles, such as cars and buses as they offer swift start up mechanism, favorable power to weight ratio and flexibility in orientation. But the significant challenge of using them in vehicle lying in the storage of fuel as the vehicles will need frequent refueling. Solid oxide fuel cells (SOFCs) got the name because they use a hard, non-porous ceramic compound as the electrolyte. SOFCs operate at very high temperatures of around 1,000°C. This high temperature operation allows it to reform fuels internally. As a result this type of cell can directly use a variety of fuels and eliminate the need of a reformer to the system. SOFCs have high operating efficiency of around 50%–60%. In applications when the generated heat is captured and reused it has even higher eminency of around 80%–85%. But the disadvantage of the high temperature operation is that it has a slow start up and requires a significant shielding to capture the heat and protect the personnel. That is why SOFCs are most suitable for utility application. They can also be used at large-scale stationary power generators to provide electricity for factories or towns. Molten carbonate fuel cells (MCFCs) use an electrolyte composed of a molten carbonate salt mixture. MCFCs are high-temperature fuel cells that operate at around 650°C and higher. Because of this high temperature operation, they can convert fuel to hydrogen internally and this process is known as internal reforming. This eliminates the cost of an external reformer and contributes to the cost reduction. But the disadvantage of high operating temperature is that it accelerates component breakdown and corrosion, which resulted in decreased cell life. MCFCs when coupled with a turbine can reach to an efficiency of about 65%. Once again if the waste heat is captured and reused, it can offer up to 85 % of efficiency. MCFCs are used in industrial and military applications and currently being developed for natural gas and coal-based power plants for electricity production. Phosphoric acid fuel cells (PAFC) operate at high temperature and have a longer start up time. They are usually less powerful comparing to other fuel cells and have electricity generating efficiency range of 37-42%. But when they used for the CHP (co generation of heat and Power), their efficiency can be as high as 85%. Phosphoric acid fuel cells (PAFC) are first to be used commercially but they are quiet expensive because they require a platinum catalyst that add to the cost. The phosphoric acid fuel cell (PAFC) are usually use in small stationary power-generation systems. Some of them have been tried in large vehicles like city buses. But because of their weight and longer start up time they are not very suitable to use in small vehicles like cars. Direct methanol fuel cells (DMFCs), unlike most of the fuel cells that powered by directly or indirectly by hydrogen, are powered by pure methanol. This is a relatively new technology with advantages over the other fuel cell type. As methanol has higher energy density than hydrogen, it has storage volume advantage over other hydrogen based fuel cell. Also methanol is liquid, so it is easy to transport or supply to the users. But DMFC requires a large amount of platinum to act as a catalyst, which make it expensive. Regenerative fuel cells (RFC), also known as reverse fuel cell, has the capacity to run in the reverse mode. A regenerative hydrogen fuel cell uses electricity and break down water to produce hydrogen and oxygen. This is a comparatively new technology and still under development. Fuel cell can be used as a clean and green energy source, as some of them don’t produce air pollutants or green house gases. Fuel cell has the flexibility to operate under different type of fuel like hydrogen, natural gas, methanol, ethanol, biogas etc. Fuel cell can be used in multiple applications and it is scalable. Fuel cell has compatibility with other green technologies like wind turbine and solar panel.